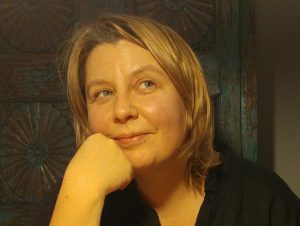 Anna Blasiak is a poet and translator. She studied Art History in Warsaw, Film Studies in Kraków and Arts Policy and Management in London. She writes poetry in Polish and in English. She translated over 40 books from English into Polish and some fiction from Polish into English (by Mariusz Czubaj, Wioletta Grzegorzewska, Jan Krasnowolski. Kaja Malanowska, Daniel Odija, Mirka Szychowiak and Irit Amiel – as Anna Hyde). She also translated poetry into Polish (by Maria Jastrzębska, Mary O’Donnell, Nessa O’Mahony, Vesna Goldsworthy and Martina Evans) and into English (by Mirka Szychowiak, Radosław Wiśniewski and Edward Pasewicz). Anna worked in museums and a radio station, ran magazines, wrote on art, film and theatre. She helps run European Literature Network and is one of the editors of Babiniec Literacki, Polish website publishing poetry written by women. More at annablasiak.com.